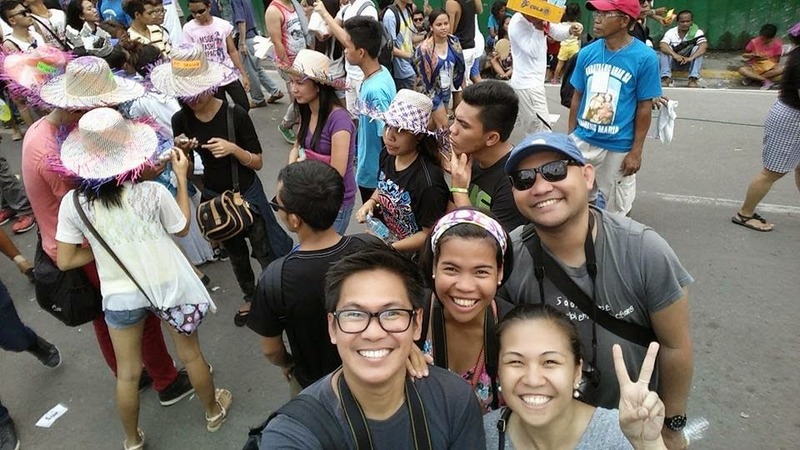 In that sequence, my 2015 Sinulog Festival experience was concluded. It was a blast with some feeling of regrets but the latter was more of the insufficient time spent for partying. Don’t judge me if I had a transient memory loss that I forgot what transpired before I got home. By the strike of twelve midnight, we decided to end our drinking spree as we are bound to wake up early the following day for the Grand Sinulog mardi gras. It would be my first time to witness the event for the many times I’ve been to Cebu City for the Sinulog Festival. However, the lovely Jona of Backpacking with a Book, relayed to the group that it has been her annual routine to visit the old district of Colon and the Basilica del Santo Nino during early morning for some photo shoots. And so we volunteered to accompany her. I have been longing to do this for quite some time but laziness strikes not to mention the time constraints. The Magellan’s Cross was our first destination. The structure from which the cross stands has candle-covered floor. Devotees have filled it up. It was the first time I saw the Magellan’s Cross, an important historical and cultural landmark of the province. The edifice is situated beside the Basilica Minore del Sto. Nino. Devotees of Santo Nino came to profess their faith. It was early morning, the crowd increases in number and I surmise they will be hearing the morning mass before the festival begins. The streets were filled by vendors of images of Santo Nino and other religious artifacts. Candles were lit in the streets surrounding the Basilica. The Basilica is still closed on account of the damages sustained due to the earthquake that hit the region last year. Mass is heard on a plaza across the church with a festive decoration while devotees settled in each corner. I may not have witnessed the procession nor heard a mass while in Cebu, but during this visit on an early Sunday morning, I say a little prayer of thanks for the life and blessings given to me. Then I came across a lady dressing an image of Santo Nino for sale. She has been doing the same for years, more of a religious vow than for profits. I recall there are meanings to every color of the Santo Nino’s garment – a red garment for the residential homes and a green garment for business locations. It was around 3AM when we decided to go home and get the much needed rest for the awaited event to follow in a few hours. This will be a long day ahead of us. From where I am staying, I walked towards Mango Square at around 9 in the morning, where our rendezvous was. The street was decorated by banderitas, small flag-shaped pieces of paper or plastic arranged in a string and hung-up during festivals. Under the beat and rhythm of the drums, trumpets and native gongs, Sinulog dance contingents showcased their routines in colorful and intricately-made costumes. It was that festive. I know for a fact that contingents from Leyte, my home province, have always been the much anticipated and watched over performers of this competition. I was able to watch the Kasadyaan Festival in Tacloban City, Leyte last June 2013 and I was really surprised how grand and world-class their performances are. The Sinulog parade lasts for almost 9 to 12 hours they say. We were standing and taking photos for almost 7 hours and unfortunately, I wasn’t able to witness the performances of Buyogan Festival of Abuyog, Leyte and Lingganay Festival of Alang-alang, Leyte, this time – top contenders for this competition, as they were positioned at the tail-end of the parade and exhaustion has already overpowered our group. Nevertheless, we were fortunate to have seen the colorful and pulsating with vigor and energy performance of this year’s Champion for street dance category – Lumad Basakanon of Cebu City. The strategic positioning of our group made us witness essential highlights of the parade. I was with Gael of Pinay Solo Backpacker, RJ of RJdexplorer and Julie of MyInkTrails in this quest. I don’t even remember sitting down for the almost 7 hours in the streets, as I was entertained by every contingent and participant of the competition. The shoving part and being shoved was all worth it. After all, this is an inevitable part of the experience. Aside from the street dance contingents, there were colorful floats and paper mache effigies contributing to the festive mood. And of course, local celebrities and models graced the affair which made the spectators go wild and ready for the next event on the streets – to party. Champion: Contempo Property Holdings, Inc.
Nearly dusk, we decided to head back to Juana Osmeña Street near the Century Plaza Hotel, where other travel bloggers and friends are waiting. The crowd goes wild as the beat of the drums were transformed into loud party music from the float of varied local celebrities. It was a challenge getting out of the crowd. But what was remarkable is the fact that the crowd was manageable and controllable. After getting shoved and shoving, we made it and did I mention insufficient lunch? 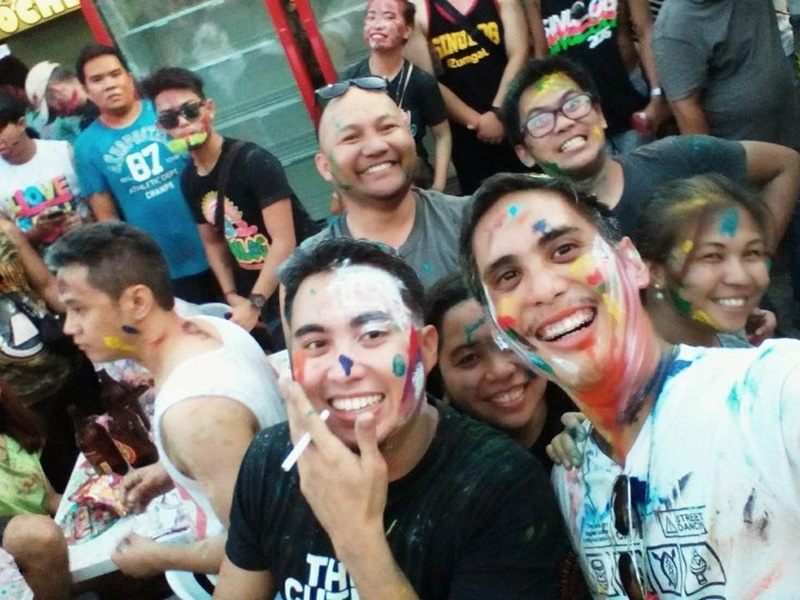 As part of the celebration, the crowd cheers and dances on the streets while others drink alcoholic beverages and apply water-based paints and colorful dye powders on the faces and shirts of whoever randomly gets their way. The spirit of merrymaking in celebration of life and thanksgiving, like any other festival in the country was felt in Cebu City. Just as I thought we would have a time to rest, the first shot glass was served as soon as we arrived at the Baseline. And more shots came, making the rest a history. Wow, what an interesting festival! I heard Philippines is one of the countries that is well known for big and colorful festivals like that. Hope I could see them one day. Enjoyed this post.